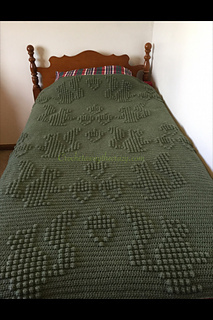 Feeling Squirrelly twin size blanket is made by using a half Double crochet bobble stitch. For more information on how to do this stitch please visit crochetawaythecrazy.com. I suggest that you complete one of the smaller HDC bobble stitch dishcloth patterns to get the hang of it.